So it’s the end of the year – time for lazy bloggers and writers everywhere to crank out a ‘clip-show’ column to prioritize events of the year. I actually rather enjoy these exercises. At first blush, ‘top five’ lists seem rather facile. They leave far too much room for the writer’s personal preferences; it’s all-but-impossible to agree on a metric that would fairly rank events, personalities, and so on. But on the other hand, trying to assign priority or causal weight is central to good social science, and hopefully, punditry. Every time you read someone say, X was ‘more’ important than Y, or A was ‘of greater significance’ than B, those locutions implicitly assigns weights. We do this all the time in common speech, even if we don’t admit it. So here is a list of five major 2014 events that impacted the US position in Asia, specifically events that are likely to increase or decrease the US level of commitment to the region. In so far as a looming Sino-US (or Sino-US/Japan) regional competition is becoming the conventional wisdom, it is helpful to take such measures occasionally. 1. The Unwanted War against ISIS. 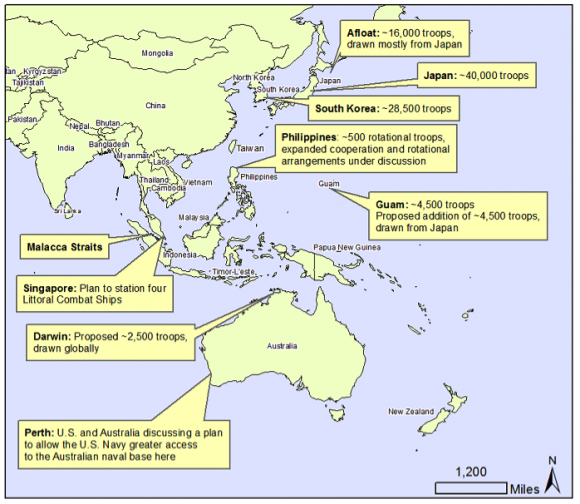 The troubles of the US pivot to Asia are a regular theme in my writing for the Diplomat. While I personally strongly support the pivot, I remain deeply skeptical that the US can actually do it, given its range of other commitments, weak domestic knowledge of east Asia, and strong cultural and religious interests in Europe and the Middle East. My November column for the Diplomat argues that the war against ISIS is precisely the sort of open-ended, vague, exit strategy-less Middle East conflict that makes it so hard for the US to pivot to another region. This may not matter, if the US can dominate the Middle East and simultaneously block Chinese regional hegemony. But at this point, only neoconservatives must believe that is possible, or desire to so inflate the defense budget that it might be. For the rest of us, it is obvious that there are genuine opportunity costs to America’s long, frequently fruitless engagement in the Middle East. The US maintains four regional hegemonies – in Latin America (the erstwhile ‘Monroe Doctrine’), Europe (through NATO), East Asia, and the Middle East/Persian Gulf. In the last three, it faces serious challenges – Putin (arguably the flimsiest and where US allies could do much more), islamist jihadism, which has proven remarkable resilient to American power, and China. Unipolarity does not mean omnipotence, so the need for the US to rank these commitments grows with new challenges. And every new war the US fights in the Middle East pushes Asia further toward China. There is a raging debate over whether China’s behavior in the last years is newly assertive or not. Some have noted, for example, that China’s claims in the South and East China Seas are not new, only the strength with which it is pursuing them But I find in Asia, where I work, that the debate is increasingly closing with the Xi Jinping presidency. As I and a number of other observers argued earlier this year, China under Xi’s new leadership managed to pick three major fights in less than a year. Japan particularly seems to tilting against China. The Abe-Xi handshake was about as grim as one could imagine. Much of the pushback notes that the Chinese are cautious and that the conflict over these islets is being ‘fought’ by fishermen and coast guards. And so it is, but this is almost certainly craft on the part of Beijing. It is widely know that the Chinese Communist Party has studied the collapse of the USSR intensively. Beijing will not make the same mistake – alienate its periphery into a harsh encircling coalition, or bankrupt its smaller economy trying to match the Americans dollar for dollar. Instead, the Chinese stratagem in the South China Sea is regular if mild pressure, leap-frogging claims, land-reclamation to generate new claimed spaces, and so on. If the US is going to pivot, southeast Asian nations will be looking for some kind of response to this ‘death by a thousand cuts’ approach to maritime disputes, and the US does not have one yet. 3. The end of wartime operational control reversion in South Korea. For the last ten years, the US and South Korean governments have wrangled over the united command of US and South Korean forces. As it stands now, Seoul has operational command (OPCON) of its forces in peacetime. As there has been no war in Korea since the 1950s, this effectively means that Seoul runs its military and defense policy. But to insure unity of command in wartime, the alliance gives OPCON to the Americans should war break-out. Korean opinion is deeply divided on this. On the one hand, OPCON reversion (to Seoul) is a long sought goal of the left. South Korean President Roh Moo-Hyun demanded it back a decade ago as a marker of South Korean independence from the US. But conservatives almost immediately called for a delay, realizing that OPCON reversion would almost certainly lessen the US commitment to Korea. In the broad American commitment to Southern security it represents, US OPCON helps keep Korea’s defense costs down (substantially) and relieves pressure on the South Korean army particularly. And this fall, the issue finally ended, as much of the Korean national security bureaucracy would prefer. OPCON reversion, many times delayed already, has now been pushed off to some vague point in the 2020s, where it will almost certainly be shelved again when needed. The ten-year OPCON soap-opera is over; the US will stay firmly tied to Korea indefinitely. 4. The continuing spat between Japan and Korea. This was yet another terrible year for relations between Japan and Korea, a topic heavily (and well) covered by the Diplomat. The low point had to be the pointless Japanese ‘review’ of the Kono Statement which did nothing to change Japan’s stance on the comfort women issue, other than to signal to Seoul once again that Japan does not take it seriously. It is unnecessary to belabor this yet again at this site, but the continuing inability of Japan and Korea to work together obviously benefits American challengers in the region, including China, North Korea, and Russia. At the time, I was quite skeptical this would make much difference. Perhaps because I spend so much time on this issue, it has always seemed self-evident to me that North Korea is the worst country on earth, worse even than the ISIS statelet. But the report – perhaps because it bears the imprimatur of the more neutral UN than US or South Korea – has generated enormous, unexpected pressure on North Korea and its patron China. China may be forced to publicly veto an effort to refer North Korea to the International Criminal Court – a terrible public embarrassment for a country that seeks global prestige. This is great news. North Korea has few friends beyond China. If all the bad publicity finally draws some distance between Beijing and Pyongyang, that could finally force North Korea to change, because its ‘system’ cannot survive without external aid. Maybe, just maybe, we will look back and see this as a turning point in finally cutting off the Kim clique. This entry was posted in Alliances, Asia, China, International Organizations, Islam, Japan, Korea (North), Korea (South), Middle East, Pivot by Robert E Kelly. Bookmark the permalink.